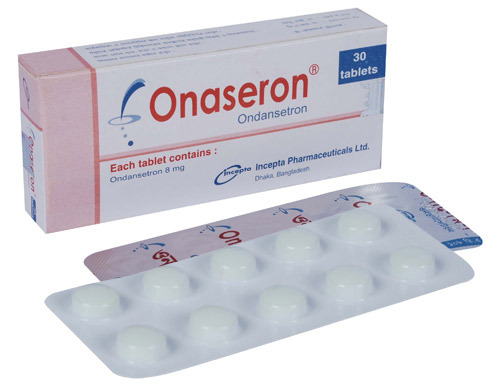 Onaseron tablet: Each film coated tablet contains Ondansetron Hydrochloride Dihydrate BP 9.977 mg equivalent to Ondansetron 8 mg.
Onaseron 4 ml IV injection: Each ml contains Ondansetron Hydrochloride Dihydrate BP 2.49 mg equivalent to Ondansetron 2 mg.
Onaseron oral solution: Each 5 ml contains Ondansetron Hydrochloride Dihydrate BP equivalent to Ondansetron 4 mg.
Onaseron ODT tablet: Each tablet contains Ondansetron USP 4 mg.
Ondansetron is a selective 5-HT3 receptor antagonist. While its mechanism of action has not been fully characterized, Ondansetron is not a dopamine-receptor antagonist. Serotonin receptors of the 5-HT3 type are present both peripherally on vagal nerve terminals and centrally in the chemoreceptor trigger zone of the area postrema. It is not certain whether Ondansetron's antiemetic action is mediated centrally, peripherally, or in both sites. However, cytotoxic chemotherapy appears to be associated with release of serotonin from the enterochromaffin cells of the small intestine. 1. Prevention of nausea and vomiting associated with highly emetogenic cancer chemotherapy, including Cisplatin >/= 50 mg/m2. 2. Prevention of nausea and vomiting associated with initial and repeat courses of moderately emetogenic cancer chemotherapy. 3. Prevention of nausea and vomiting associated with radiotherapy in patients receiving either total body irradiation, single high-dose fraction to the abdomen, or daily fractions to the abdomen. 4. Prevention of postoperative nausea and/or vomiting. Parenteral: 32 mg single dose infused over 15 minutes by diluting with 50 ml saline (5% dextrose or 0.9% NaCl) 30 minutes before starting chemotherapy. Alternative therapy: Three dose of 0.15 mg/kg body weight. The first dose is infused over 15 minutes beginning 30 minutes before the starting chemotherapy. Subsequent doses (0.15 mg/kg) are administered 4 and 8 hours after the first dose of administration. Moderate emetogenic cancer chemotherapy: 8 mg (one 8 mg tablet) administered 30 minutes before start of emetogenic chemotherapy. A further 8 mg dose should be administered after 8 hours of the first dose. One 8 mg tablet should be administered twice a day (every 12 hours) for 1-2 days after completion of chemotherapy. Parenteral (6 months onwards): Three dose of 0.15 mg/kg body weight. The first dose is infused over 15 minutes beginning 30 minutes before starting moderately to highly emetogenic chemotherapy. Subsequent doses (0.15 mg/kg) are administered 4 and 8 hours after the first dose of administration. Oral (4-11 years): 4 mg tablet should be taken 30 minutes before the start of chemotherapy. The other 2 doses should be taken 4 and 8 hours after the first dose. Then 4 mg tablet should be administered 3 times a day (every 8 hours) for 1-2 days after completion of chemotherapy. The recommended dose is 8 mg tablet 3 times a day. For total body irradiation: One 8 mg tablet should be administered 1 to 2 hours before each fraction of radiotherapy administered each day. For single high-dose fraction radiotherapy to the abdomen: One 8 mg tablet should be administered 1 to 2 hours before radiotherapy, with subsequent doses every 8 hours after the first dose for 1 to 2 days after completion of radiotherapy. For daily fractionated radiotherapy to the abdomen: One 8 mg tablet should be administered 1 to 2 hours before radiotherapy, with subsequent doses every 8 hours after the first dose for each day. Oral: 16 mg (two 8 mg tablets) 1 hour before induction of anesthesia. Parenteral : Weighing less than 40 kg: 0.1-mg/kg body weight in a Single dose . Weighing more than 40 kg: 4mg single dose The dose should be immediately before induction of anesthesia. The rate of administration should not be less than 30 seconds, preferably over 2 to 5 minutes. Alternatively, the dose can be administered post-operatively if the patient experiences nausea and/or vomiting shortly after surgery. 4 a. Adult: 8 mg three times daily. 4 b. Pediatric (1 month or over): 0.15 mg/kg body weight three times daily. 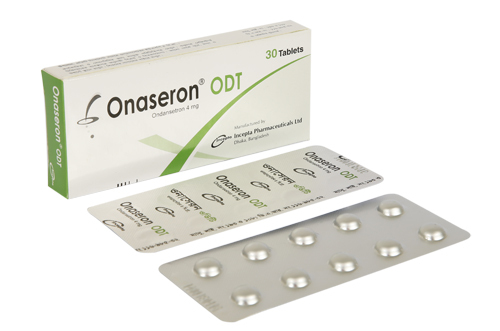 Onaseron ODT should be removed from the blister gently. Then it should be immediately placed on top of the tongue where it will dissolve in seconds and swallowed with saliva. Administration with liquid is not necessary. 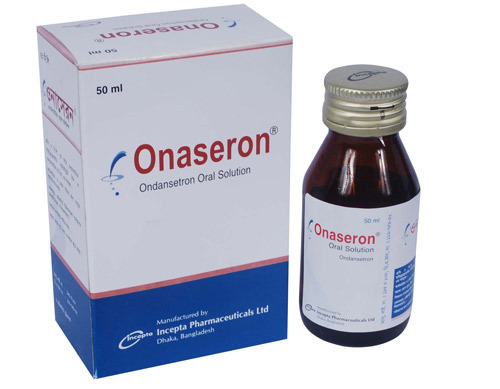 Generally Ondansetron is well tolerated. However few side effects including headache, diarrhoea, fatigue, dizziness and constipation may be seen after Ondansetron is administered. Nursing mother: It is not known whether Ondansetron is excreted in human milk. 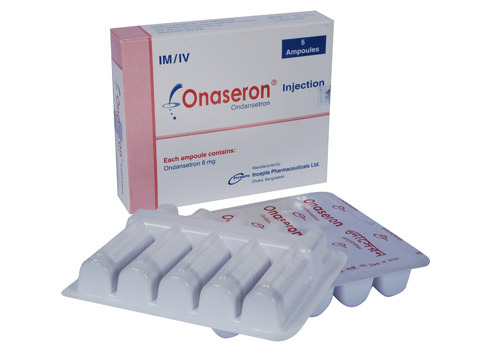 Because many drugs are excreted in human milk, caution should be exercised when Ondansetron is administered to a nursing woman.